Privilages of being a member of Bursa Chamber of Commerce and Industry added brand new benefit to the list. Our chamber offered an opportunity to benefit from advantageous services to their members through a new common platform. We will conduct our communication with BTSO members in a healthy way through a well-structured platform, which enables our members to benefit from the high purchasing power of the organization through BTSOWE. In addition, we prepare the BTSOWE website in the form of a portal which carried out by the Corporate Communication Directorate of BTSO in favor of providing the accurate information regarding activities of our Chamber in a timely manner to all institutions and individuals in which the organization is in contact with. BTSOWE is a project we have built with the force of unity in our city which aims to carry the common sense we have created in to different areas. Through BTSOWE project we provide the opportunity to communicate and share ideas instantly by offering concrete benefits. BTSOWE members holds an exclusive card and able to benefit from special advantages. BTSOWE cards was launch in August 2017 with the participation of over 42 thousand privileged members. 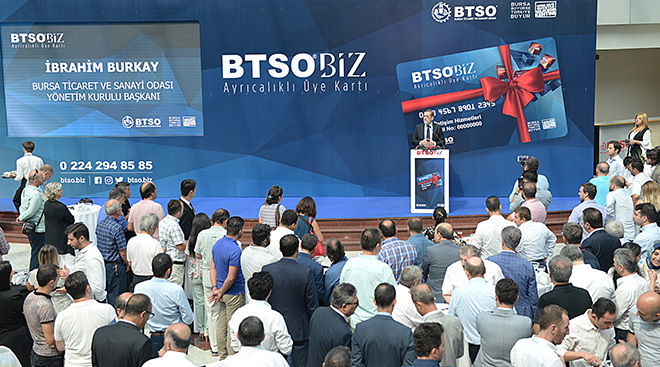 BTSOWE card offers to the representatives of Bursa business world the opportunity to benefit in the most advantageous conditions in terms of products and services of numerous companies in various sectors from communication to education, from health to energy, from transportation to accommodation.